Description of Dog Lung Cancer. The definition of Dog Lung Cancer is Pulmonary Neoplasia (meaning ' New Growth'). The lung is the respiration organ whose primary function is to transport oxygen from the air into the bloodstream. It then releases carbon dioxide from the bloodstream back into the air. The cause of lung cancer is unknown, however there are more cases of cancer in dogs that live in cities and dogs that are exposed to second hand smoke. Lung cancer mainly affects older dogs but it can also occur in puppies and young dogs. Unfortunately lung cancer in dogs is aggressive, tumours are usually malignant and the cancer frequently spreads to the lymph nodes. There are two type of lung cancer that dogs can develop: Primary lung cancer and Metastatic lung cancer. When you are worried about your pet dogs or puppies it is wise to make general observations and a note of your dog's general well-being before considering a health issue and problem such as Dog Lung Cancer. Overall physical condition? Mental attitude? Appetite? Condition of bowels and urinary apparatus? The nose of healthy dogs or puppies is moist and cool but in sick dogs it is usually hot and dry. Hair loss? Dry skin? Discharges? These general observations are useful to consider whilst checking out the symptoms of Dog Lung Cancer. - Primary lung cancer is malignant tumours that originally develop in the tissue of the lungs. The most common type of primary tumour is a carcinoma. This type of cancer produces malignant tumours which develop in the epithelial tissues in the lungs. The prognosis is better for an animal suffering from primary lung cancer especially if it is diagnosed early and the cancer has not had a chance to spread to other parts of the body. - Metastatic lung cancer starts with a tumour in another part of the body which travels to the lungs by the bloodstream. Metastatic lung cancer is the most common form of lung cancer in dogs and unfortunately dogs who are diagnosed with this secondary form of cancer have less chance to recover from this disease than dogs diagnosed with Primary lung cancer. 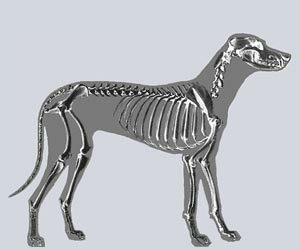 Canine Arthritis treatment - To diagnose lung cancer your veterinary surgeon will take a x-ray of the dogs lungs. The presence of fluid in the lungs or chest cavity as well as a tumour may suggest further investigation. Canine Arthritis treatment - A biopsy will then be taken and sent to the laboratory for confirmation of the diagnosis and blood tests may also be performed. Lung cancer is treatable if detected at an early stage, unfortunately in most cases the cancer will have spread to other parts of the body. Canine Arthritis treatment - The treatment choice will be your decision, your veterinary surgeon may offer pain relief medication to keep your dog comfortable for as long as possible or suggest treating the cancer through radiation, surgery or chemotherapy. Canine Arthritis treatment - The treatment choice depends on each individual case, whether the animal is suffering and how far the disease has spread. Pet Insurance for Dog Lung Cancer. Remember canine insurance / pet dogs health insurance for treatment of health and medical problems such as Dog Lung Cancer. Unexpected visits to the vet and veterinary treatments for your dogs and puppies due to illnesses such as Dog Lung Cancer can quickly add up so get quotes for canine health / pet insurance coverage for treatment due to accidents, treatment of illnesses, prescriptions, surgeries and possible hospitalization treatment for your dogs or puppy. Get the best deals for pet insurance from pet insurance comparison websites - make sure you get the best rates for canine health insurance to cover visits to the Vet for the diagnosis and treatment of unexpected ailments such as Dog Lung Cancer. The sole purpose of the Dog Lung Cancer section on the Dog Symptoms and Canine Health website is to act as a reference guide to provide useful information to the owners of dogs and puppies. This article on Dog Lung Cancer is not intended to be used to diagnose or treat sick dogs or as a substitute for obtaining professional veterinary advice. Please remember that if you are in any doubt about your Dog's Health, or problems associated with Dog Lung Cancer, please consult your Canine Veterinary Specialist immediately for professional treatment. Your vet will diagnose whether Dog Lung Cancer is the problem and prescribe appropriate medication and treatment.